Quarto is a town on the outskirts of Naples, which has more than forty thousand inhabitants and where a football team was able to demonstrate that it is possible to fight the camorra. Until February 2011, the old football society was managed by Giuseppe Polverino, called "Peppe 'o Barone", boss of camorra who used the club to launder money and to get more credibility and respect from the people. Today, the renamed “Nuova Quarto Calcio per la Legalità”, is the first football team managed by an anti-racket association and returned entirely to its citizens, after being sequestrated in 2011 to the organized crime within a police operation. “Nuova Quarto Calcio per la Legalità” plays at the “Giarrusso” stadium, where to welcome the players and to frame the pitch are numerous posters and banners with the inscription “Con la legalità si vince...sempre!”. The players of the team of Campania at the beginning of the season not only signed a contract, but also an ethics code, claiming to be blameless and have no pending charges. Players, but especially guys with clean faces, between the ages of 17 and 32 years, who work and in many cases have already a family, who fought for the entire duration of the league for the ransom of their city, dreaming perhaps, one day, to play in Italian Serie A. Players of “Nuova Quarto Calcio per la Legalità” football team before a training at the local stadium of Quarto, in Italy on April 24, 2013. The team of Quarto, once under the control of Polverino camorra organization, has now become a legality symbol. 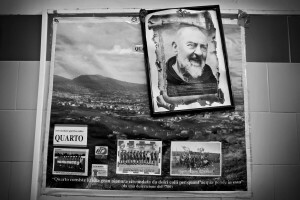 A big poster of Padre Pio is attached in the dressing room of “Nuova Quarto Calcio per la Legalità” football team at the local stadium of Quarto, in Italy on March 5, 2013. The team of Quarto, once under the control of Polverino camorra organization, has now become a legality symbol. Players of “Nuova Quarto Calcio per la Legalità” football team go outside the dressing room before a training at the local stadium of Quarto, in Italy on March 5, 2013. The team of Quarto, once under the control of Polverino camorra organization, has now become a legality symbol. 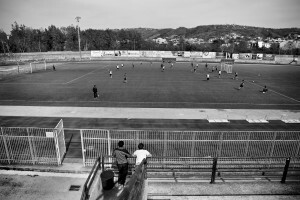 Players of “Nuova Quarto Calcio per la Legalità” football team during a training at the local stadium of Quarto, in Italy on April 24, 2013. The team of Quarto, once under the control of Polverino camorra organization, has now become a legality symbol. Players of “Nuova Quarto Calcio per la Legalità” football team during a training at the local stadium of Quarto, in Italy on March 7, 2013. The team of Quarto, once under the control of Polverino camorra organization, has now become a legality symbol. The goalkeeper of “Nuova Quarto Calcio per la Legalità” football team during a training at the local stadium of Quarto, in Italy on April 24, 2013. The team of Quarto, once under the control of Polverino camorra organization, has now become a legality symbol. The goalkeeper of “Nuova Quarto Calcio per la Legalità” football team drinks water during a training at the local stadium of Quarto in Italy on April 24, 2013. The team of Quarto, once under the control of Polverino camorra organization, has now become a legality symbol. Alessandro Sena, second goalkeeper of “Nuova Quarto Calcio per la Legalità” football team after a training at the local stadium of Quarto, in Italy on March 5, 2013. The team of Quarto, once under the control of Polverino camorra organization, has now become a legality symbol. 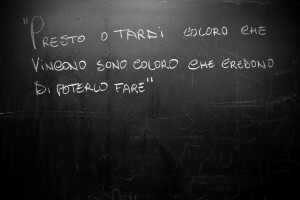 A blackboard with the words “Presto o tardi coloro che vincono sono coloro che credono di poterlo fare” who means “Sooner or later those who win are those who believe they can do it” is attached on the wall of the dressing room of Nuova Quarto football team in Quarto on March 5, 2013. The team of Quarto, once under the control of Polverino camorra organization, has now become a legality symbol. 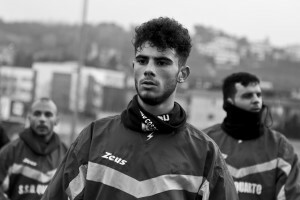 A player of “Nuova Quarto Calcio per la Legalità” football team in the dressing room after a training at the local stadium of Quarto, in Italy on March 7, 2013. The team of Quarto, once under the control of Polverino camorra organization, has now become a legality symbol. Players of “Nuova Quarto Calcio per la Legalità” football team in the dressing room after a training at the local stadium of Quarto, in Italy on March 7, 2013. The team of Quarto, once under the control of Polverino camorra organization, has now become a legality symbol. Franco Palma, player of “Nuova Quarto Calcio per la Legalità” football plays with his daughter at home in Quarto, Italy on April 24, 2013. The team of Quarto, once under the control of Polverino camorra organization, has now become a legality symbol. A portrait of Franco Palma, player of “Nuova Quarto Calcio per la Legalità” at his home in Quarto, Italy on April 24, 2013. The team of Quarto, once under the control of Polverino camorra organization, has now become a legality symbol. Roberto D’ Auria and Luca Tucci, players of “Nuova Quarto Calcio per la Legalità” football team during a relaxing day in Quarto on April 24, 2013. The team of Quarto, once under the control of Polverino camorra organization, has now become a legality symbol. 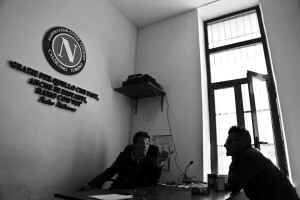 The player Roberto D’ Auria and the coach Ciro Amorosetti speak in the office of “Nuova Quarto Calcio per la Legalità” football team after a training at the local stadium of Quarto, in Italy on April 15, 2013. The team of Quarto, once under the control of Polverino camorra organization, has now become a legality symbol. A Player of “Nuova Quarto Calcio per la Legalità” football team plays with a dog after a training at the local stadium of Quarto, in Italy on April 20, 2013. The team of Quarto, once under the control of Polverino camorra organization, has now become a legality symbol. 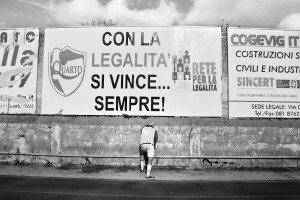 A player of “Nuova Quarto Calcio per la Legalità” football team near the write “Con la legalità si vince sempre” who means “with the law always wins” during a match at the local stadium of Quarto, in Italy on April 20, 2013. The team of Quarto, once under the control of Polverino camorra organization, has now become a legality symbol. 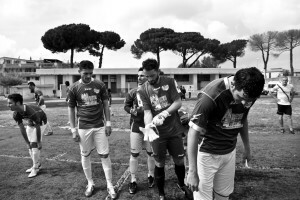 A player of “Nuova Quarto Calcio per la Legalità” football team before an offical match at the local stadium of Quarto in Italy on April 20, 2013. The team of Quarto, once under the control of Polverino camorra organization, has now become a legality symbol. 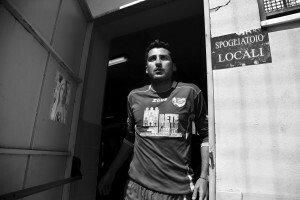 Luca Tucci, player of “Nuova Quarto Calcio per la Legalità” football team go outside the dressing room before an official match at the local stadium of Quarto, in Italy on April 28, 2013. The team of Quarto, once under the control of Polverino camorra organization, has now become a legality symbol. Players of “Nuova Quarto Calcio per la Legalità” football team enter the field during an offical match at the local stadium of Quarto in Italy on April 20, 2013. The team of Quarto, once under the control of Polverino camorra organization, has now become a legality symbol. 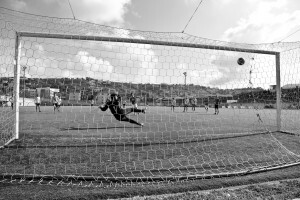 Roberto D’ Auria, player of “Nuova Quarto Calcio per la Legalità” football team, scores a goal at the local stadium of Quarto, in Italy on April 20, 2013. The team of Quarto, once under the control of Polverino camorra organization, has now become a legality symbol. 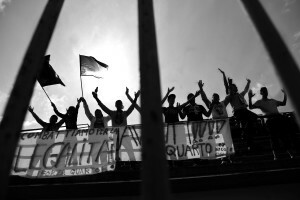 Supporters of “Nuova Quarto Calcio per la Legalità” football team at the local stadium of Quarto, in Italy on April 20, 2013. The team of Quarto, once under the control of Polverino camorra organization, has now become a legality symbol. Roberto D’ Auria and Luca Tucci, players of “Nuova Quarto Calcio per la Legalità” football team exult after a goal at the local stadium of Quarto, in Italy on April 20, 2013. The team of Quarto, once under the control of Polverino camorra organization, has now become a legality symbol.